Malay Chick Lit. | escaped. I know I'm so outdated about this, but I just came across this particular headline on NST Online - some company in Malaysia is going to publish chick lit novels in Malay. I don't mean to be rude, but seriously. I, for one, really don't think it's going to work. Chick lit is stories written by women, about women and for women to read. Up until now I think I've read so many chick lit books and blogs that I know the book/blog is the chick lit type when I first read the first line. I think we all do. "Chick lit often features hip, stylish, career-driven female protagonists, usually in their twenties and thirties. The women featured in these novels may be obsessed with appearance or have a passion for shopping. The setting is generally urban and the plot usually follows the characters' love lives and struggles for professional success (often in the publishing, advertising, public relations, or fashion industry). The style is usually of an airy, irreverent tone and includes frank sexual themes. Almost all chick-lit books contain humor. They also frequently use current slang." But I cannot possibly imagine myself reading a supposedly chick lit novel - in Bahasa Malaysia. Try imagine yourself buying a book titled Jangan Pandang Aku (Don't Look At Me) with cartoons cover page, and about this girl named Monica who's living in Beverly Hills which the story goes by her interesting life; her conflicts between her fiance and her crush, while handling a high-profile showbusiness case. Yes, very interesting. The only problem is, it's all in Bahasa Malaysia. 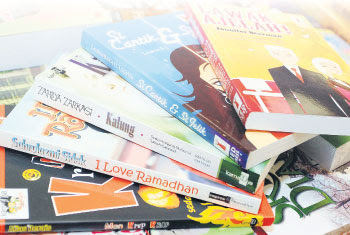 I'd rather read the books about Malay poems, history or the famous Malay short stories. At least they have some common sense I can relate to, the nilai-nilai our ancestors want us to learn and practice in our lives and live them up to our grandchildren. At least I can learn a bit or two about Malay warriors. But reading a Malay chick lit stories just seems so impractical. The humor is not going to work. All the snotty, lighthearted jokes and lines are not going to be funny. The phenomenon is not there. And mind you, this is not one of the many I-am-so-ashamed-of-my-roots lines, it's not because I think low of Bahasa Malaysia. I AM PROUD of my own mother tongue, seriously. This is about the chick lit thing. But really, this is just me talking. Would you buy a Malay chick lit novel? r u serious?nvr heard of this. i just found out about it..theyve published some,but i dont know about the feedback. i heard theyre translating shopaholics series into malay too.dont know true or not. Wow, interesting.. Not a fan of novels, but I wonder how does it feel reading 'Kaki Membeli belah' siri Bahasa Malaysia. Lol, i think I translating it wrong. Sounds so wrong! hahahah!ok that ones funny..i wonder if theyre really gonna use it as the title..it sounds so wrong.but ade ke yg sounds good anyway. try translating 'the devil wears prada' = ?? eh2 ke aku yg salah phm ape yg zatil tulih nih? chick lit novel tuh asalnyer in english,pastu translate xseswai atau mmg kalo asalnyer in BM pon xseswai gak atau due2 baai pon xbole? tula pasal kan.its just not the same.maybe ade laa org akan bace kot,tapi diorg takkan dpt what the original writer wants the audience to get..kot. yes yes.same la dgn bace Quran.even ade tafsir pun still better kalau fhm dlm bahase arab kan.lagi afdal. couldn't agree more with ur entry.aisya sofea's phase?totally.haha! i was too busy sleeping..haihh.need to love this blog more so i dont get fat..hehe. HAAHHAHAH haahhhh jendela hati!kau still ade buku tu ke buzzy?hahah.pfft rindunye zmn budak2..